The NEPSE index as at Mid-December 2017 closed at 1,520.20 points compared to 1,530.10 points in the same period last year, which is a decline of 0.65%. 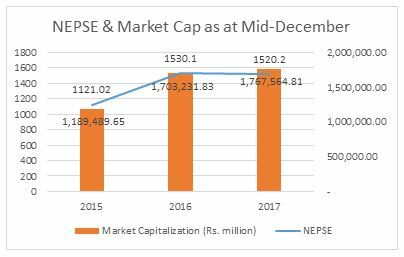 Whereas, the market capitalization of NEPSE increased from NPR 1,703.23 billion in Mid-December 2016 to NPR 1,767.57 billion in Mid-December 2017. 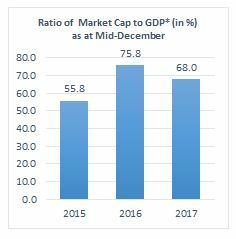 On the other hand, the ratio of market capitalization of NEPSE to GDP as at Mid-December 2017 has dropped down to 68% compared to 75.8% in the last year during the same review period. The interbank rate among commercial banks as at December 2017 has shoot up to 4.83% compared to 2.68% in the previous month. It is the highest interbank rate being reported in last two years indicating commercial banks are facing difficulty in maintaining their CD ratio and are in shortage of loanable fund. The base rate of commercial banks is hovering at 9.87% as at Mid-December 2017 compared to 10.11% in the previous month. Last year during the same review period, the base rate of commercial banks stood at 6.78%, meaning the borrowers have to pay higher interest rate at present, which is a major setback for them. The consumer price inflation in Nepal stands at 4.2% in Mid-December 2017. 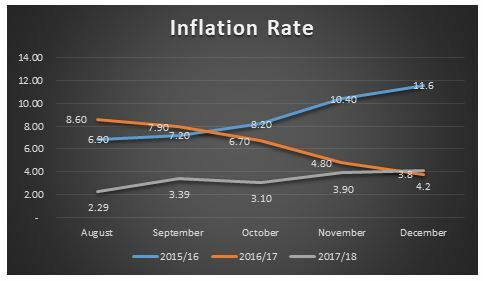 Though the inflation rate is on the lower side in the first five months of this fiscal year compared to previous two fiscal years, it is slightly increasing mainly due to rise in price of food and beverage items. However, the current market interest rate on deposits or, government bond and corporate debentures can easily beat this inflation rate. 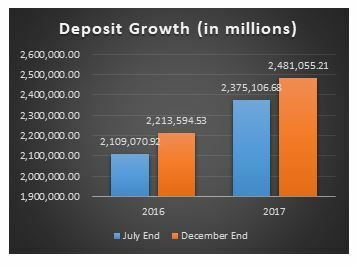 The deposits of BFI’s as at December End, 2017 increased to NPR 2,481.06 billion by 4.46%, compared to NPR 2,375.11 billion in July End, 2017. The growth during the same period in last year was 4.96%. Out of the total deposits at the BFIs, the share of demand deposits increased from 8.1 percent to 8.2 percent and fixed deposits from 31.8 percent to 41.6 percent in mid-December 2017 compared to a year ago. However, the share of saving deposits decreased to 36.5 percent from 42.9 percent a year ago. The share of institutional deposits in total deposit of Bank and Financial Institutions (BFIs) declined to 45.5 percent in mid-December 2017 from 47.4 percent a year ago. 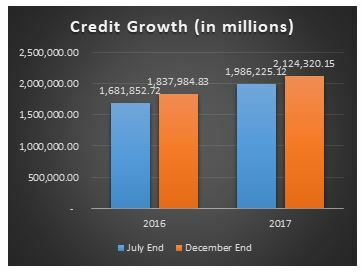 The credit disbursement of BFI’s as at December End, 2017 increased to NPR 2,124.32 billion by 6.95%, compared to NPR 1,986.23 billion in July End, 2017. The growth during the same period in last year was 9.28%. Till the first five months of FY 2017/18, NRB has mopped up NPR 127.2 billion through open market operation, out of which NPR 42.45 billion was mopped up under deposit collection auction and NPR 84.75 billion through reverse repo auction on a cumulative basis. In the corresponding period of the previous year, NPR 92.25 billion liquidity was absorbed. In contrast, in the first five months of FY 2017/18, NRB injected Rs. 167.19 billion through purchase of US dollars, whereas NPR 44.05 billion was injected through repo auction in the wake of liquidity crunch in the banking system compared to NPR 10.01 billion last year during the same period. In addition, the BFI’s has also utilized Standing Liquidity Facility (SLF) of NPR 20.58 billion in the first five months of this fiscal year to further manage the liquidity in the banking system. The BFI’s had utilized such facility of NPR 10.05 billion only during same period last year. 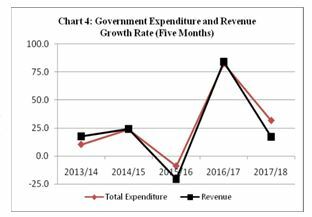 In comparison to first five months of FY 2016/17, the government expenditure has increased by 31.70%to NPR 256.30 billion after successful completion of state and central level election, helping to inject some liquidity into the system. On the other hand, the government revenue witnessed the growth of 16.42% compared to corresponding period of the last fiscal year. The government revenue for the first five months in this fiscal year stood at NPR 242.97 billion. Though the government revenue collection has been less than the target, it is likely to see an improvement in next month’s report, once the final figures of tax collected till Poush End of this fiscal year is ascertained. The country’s BOP position is in deficit by Rs. 9.27 billion till the first five months of FY 2017/18, mainly due to huge deficit seen in current account by Rs. 41.96 billion as a result of elevated level of imports and a decline witnessed in worker’s remittance. During the corresponding period in last year, BOP was in surplus by Rs. 28.78 billion, whereas the current account was at surplus by Rs. 3.49 billion. 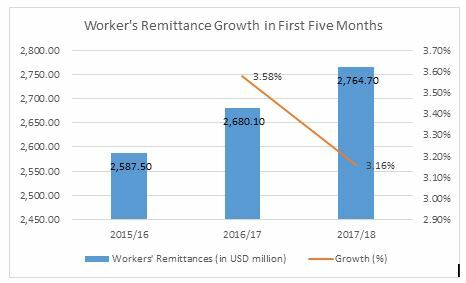 Looking at the first five months’ data of FY 2017/18, the worker’s remittance has witnessed a decline of 3.16% to reach $2,764.70 million compared to 3.58% growth in 2016/17. This can be an alarming factor as our country’s economy is highly dependent on remittance, and can impact money flow in the country & its financial system. As per the data of Department of Foreign Employment, the number of Nepalese workers seeking foreign employment has decreased by 2.5 percent in the review period. It had decreased by 8.9 percent in the same period of the previous year. Moreover, the number of workers outbound to Malaysia jumped up, while that to Saudi Arabia and Qatar shrank significantly.